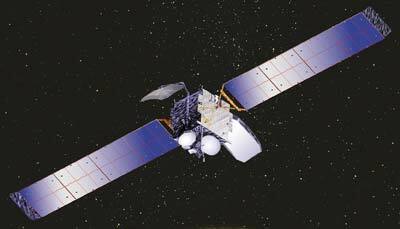 Space Communications Corporation (SCC) of Tokyo ordered its second spacecraft from Hughes Space and Communications International (HSCI), Inc., on 6 April 1998. The new communications satellite will begin serving Japan around the turn of the century from its orbital slot of 162 degrees East longitude. HSCI is now Boeing Satellite Systems, International, Inc.
Called SUPERBIRD-4 (renamed Superbird B2 on orbit), the satellite is a Hughes HS-601HP model and was successfully launched on Feb. 17, 2000, on an Ariane-44LP H10-3 rocket. SUPERBIRD-4 allows SCC to meet increasing demand for business telecommunications services throughout Japan and the Asia-Pacific region, via its 23 active transponders in Ku-band and a steerable Ku-band spot beam. The satellite will also carry broadband and high-speed data services, via 6 transponders in Ka-band. SUPERBIRD-4 provides 5.5 kW total power at end of life. This is made possible with two solar wings, each with three panels of silicon solar cells and one panel of dual-junction gallium arsenide solar cells. The satellite was built in the Los Angeles-area factory of Hughes Space and Communications Company (HSC). All Hughes HS-601HP spacecraft use the same basic bus design, allowing the company to realize efficiencies gained by production volume, tooling investments, and quantity buys. Hughes introduced the 601 in 1987. Whether in the "classic" or the "HP," for high-power, configuration, it has become the world's best-selling large satellite model, with more than 70 ordered by customers around the world. The Boeing 601 body is composed of two modules. The first contains the primary structure that carries all launch vehicle loads and contains the propulsion subsystem. The second module is a structure of honeycomb shelves that hold the communications equipment, electronics, battery packs, and isothermal heat pipes. Reflectors, antenna feeds, and solar arrays mount directly to the primary module, and antenna configurations can be placed on three faces of the bus. This modular approach allows work to proceed in parallel, thereby shortening the manufacturing schedule and test time.